William Rossel, disciple of legendary tabla maestro Pandit Swapan Chaudhuri, is a talented tabla player, educator, composer, and inventor in the field of world music. Originally a student of Western classical vocal music, he began training in Hindustani music nearly two decades ago under sitarist Nalini Vinayak. Since 2006, he has been training under tabla maestro Pt. Swapan Chaudhuri at both the Ali Akbar College of Music and at the California Institute of the Arts where he earned a Master of Fine Arts in North Indian Classical Music, also studying Indian music theory from sarode master Ustad Aashish Khan. 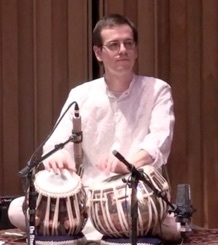 Equally strong on tabla as a soloist and accompanist, William has accompanied such prominent artists as Alam Khan, Arjun Verma, Suman Laha, Manik Khan, Bruce Hamm, Steve Oda, Rita Sahai, and many others. 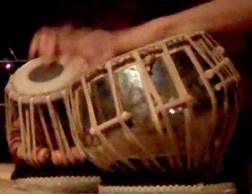 He has given numerous solo recitals and lecture demonstrations at the Ali Akbar College of Music, the Aashish Khan School of World Music, Fort Mason Center of Arts and Culture, the San Francisco Asian Art Museum, the Sangati Center, UC Berkeley, California Institute of the Arts, California College of the Arts, California Jazz Conservatory, California Polytechnic State University, Sonoma State University, Florida State University, Yuba College, Pasadena City College, and at private venues across the country. A professor of music at Yuba College, William is the director of the Yuba College North Indian Music Ensemble, which he created in 2016, and he teaches a wide range of classes, including Intro to World Music, Music as Culture, Western Music Appreciation, Popular Music of the U.S. and Applied Lessons in Percussion. William, is also a tabla instructor at the Ali Akbar College of Music and teaches rhythm theory (taal). He is also a Senior Lecturer at the California College of the Arts, in Oakland, and has directed North Indian music ensembles at the California Institute of the Arts’ Community Arts Partnership. William's interests in world music have led him to study the music of Indonesia, Uganda, Tanzania, Ghana, and many others. He spent half a year in a remote village in northern Bali, conducting field research and training under master musicians I Made Terip and I Putu Putrawan and was a member of Sekar Jaya, a world-renowned Gamelan ensemble, playing in their Gong Kebyar, Anklung, Joged and Jegog ensembles. Other musicians William has studied under include Randy Gloss, I Nyoman Wenten, Andrew Grueschow, Houman Pourmehdi, Alfred Ladzekpo, Damascus Kafumbe, Dr. Michael Bakan and Dr. Frank Gunderson. Additionally, William directs music workshops for students with autism and other developmental differences through Youth In Arts, a leading arts education non-profit organization. 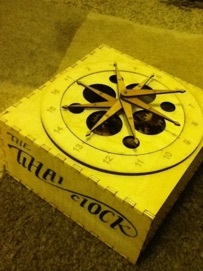 William is the inventor of the Tihai Clock, a mechanical means of completely representing the many rhythmic cadences of Hindustani music, known as tihai. He lives in San Anselmo, California where he teaches Tabla privately.